Chances are if you’re reading this you already live in Cary or Western Wake and there’s probably little need to convince you that this is a great place to live and raise a family. But isn’t it easy to get caught up in our busy lives and forget to take the time to enjoy the great towns that attracted us to this area in the first place? 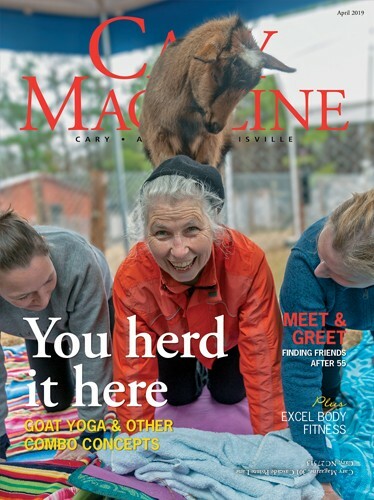 In this year’s relocation section, we will reacquaint you with some of the features that make Cary a great place to live and hopefully introduce you to some new ones. If you are considering a move to or within Western Wake, then we’ve got some great community recommendations to get you started in your search. In addition to Cary’s established neighborhoods, several new neighborhoods are being built to accommodate the tremendous growth Western Wake has seen and will continue to experience going forward. No matter your background, there truly is something for everyone here in Western Wake. It’s no secret that the last few years have been tough — tough housing market, tough job market, tough for families all around. But Cary, Western Wake and much of the Triangle have fared well in comparison with many other areas of the country. “I’d call it the steady Eddie,” said Kim Dennis, a real estate broker with Fonville Morisey. “Cary didn’t experience double-digit home value appreciation, so we didn’t have as much bust either.” Luckily for Cary, most people who buy homes here actually want to live here for some time, and the area hasn’t suffered from speculative home buying like so many struggling markets. While we can’t claim to be booming yet, market activity has definitely started to pick up. Dennis works with Rich Massong, another real estate broker with Fonville Morisey, and they have especially noticed a turnaround in the “relocation buyer” and “move-up buyer” markets. “Limited hiring has limited relocation,” said Massong. “But now companies are starting to move people in or out again and the relocation market is picking up.” Massong and Dennis noticed they are spending more time with relocators, possibly over multiple visits to the area. Employers are allowing more time for scouting the area with the hope that the move will be enjoyable for the entire family — and that the employee will establish long-term roots in the community. The “move-up buyer” is another market segment that appears to be gaining confidence. Low interest rates and increasing economic security are enticing families who are ready to spread their wings to take advantage of the buyer’s market. Proper pricing is key for those looking to sell a home because it translates to a good value for the prospective buyer. Dennis and Massong specialize in northwest Cary, the area around Green Hope and Panther Creek high schools. In this area, a home priced properly spent an average of 54 days on the market. If one or more price reductions were necessary for sale, then the average days on market jumped to 174. There are a lot of great places to live out there, but Cary consistently ranks among the best. “The number one reason is jobs,” said Massong. “There is widespread diversity of employment here: telecom, biotech, high tech, city government and state government.” Proximity to Research Triangle Park and the Raleigh-Durham International Airport make Cary a great choice for commuters. High-quality public, private and university education options, access to top-notch medial facilities and comfortable climate all appeal to families and businesses looking for a new home. Cary combines small-town charm with all the conveniences of a big city, making it good middle ground for families coming from a variety of areas. “Cary can seem hometown or high class depending on your perspective,” said Shanna Middleton, owner of Real-eStage, a real estate firm in Downtown Cary that offers interior design and staging services. Middleton moved to Cary from Scottsdale, Ariz., so in comparison, Cary seemed very down-to-earth. The area appeals to people from all stages of life: young professionals, families, retirees and everything in between. Western Wake has beautiful single-family homes, low-maintenance townhomes and active adult communities all surrounded by enviable parks, shopping and schools. Cary might be any mover’s dream, but it’s a daunting task trying to find your new home among the plethora of good options. Consider these neighborhood recommendations to get started. MacGregor Downs is one of Cary’s oldest and most well-known communities. Located off Highway 64, here you’ll find mature trees and landscaping, homes built from the 1960s onward and a golf course and country club. The neighborhoods of MacGregor Downs, MacGregor West and Balmoral Townhomes all make up the MacGregor subdivision. Some residents who love the area are choosing to rebuild their older homes rather than moving to newer models. Amberly, located off Highway 55 in west Cary, encompasses a variety of sub-neighborhoods each with its own characteristics. From townhomes to custom homes, options abound to suit various lifestyles and price points. Amberly boasts extensive resident amenities including the Residents’ Club with swimming pools, a fitness center, a full-court gym and social events; a 19-acre lake; greenway trails and recreational areas. Kitts Creek has been designed to embrace “traditional neighborhood design,” an emerging movement that seeks to create communities reminiscent of early 20th-century America. 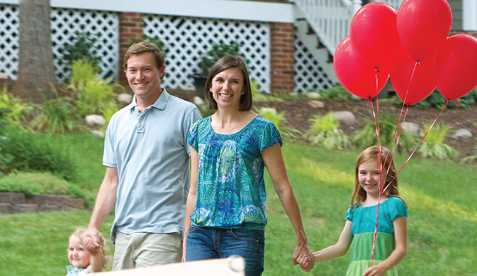 With pedestrian-friendly streets, sidewalks and front porches, Kitts Creek aims to create a true community atmosphere. Homes in Kitts Creek feature a range of architectural styles including Queen Anne, Charleston, English Manor and Southern Plantation, just to name a few. The result is a beautiful streetscape with homes that exude personality. Kitts Creek is located in Morrisville near Highway 54 and McCrimmon Parkway. Downtown Apex may have an official Historic District designation — it is a turn-of-the-century railroad town — but it is bustling with activity now more than ever. There are a variety of shops, restaurants and services to seek out, many of them independently owned by Apex residents. In the blocks that surround the downtown, you’ll find a wide selection of potential homes ranging from older single-family homes to the brand new Villages of Apex, a mixed-use community featuring condos, townhomes and single-family homes. Living in CopperLeaf gives you space to stretch your legs. Homesites can range up to three-quarters of an acre, and the neighborhood itself is somewhat off the beaten path. Located in west Cary on Morrisville Parkway past Green Level Church Road, the area is poised for growth but still feels private. Copperleaf features stunning custom homes, a community pavilion, pool and neighborhood trails that connect to the American Tobacco Trail. The high-end luxury homes built by local custom builders feature superior craftsmanship, luxury finishes and details, and options like outdoor kitchens and living spaces. Located at the intersection of Davis Drive and High House Road, Searstone will occupy 75 acres of historic Cary farmland. The community is striving to preserve the natural beauty of the location with tree-lined trails, a botanical garden and lake. Floor plan options fit any space requirement from 1–2 bedroom flats up to 3-story homes with garages. Searstone will also have a central plaza filled with services, fine dining and shopping.